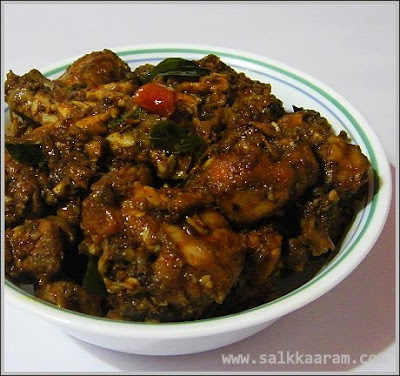 Chicken Roast / Kozhi Ulli Mulaku | Simple and Delicious ! Mix the ingredients together except curry leaves and coconut oil. Add salt,pour little water and allow to cook on a medium flame, keeping the lid closed. After the chicken is cooked well, allow the excess water to reduce by cooking on a low flame. When the curry turns dry, remove from fire. Put curry leaves into that with the above dry curry. 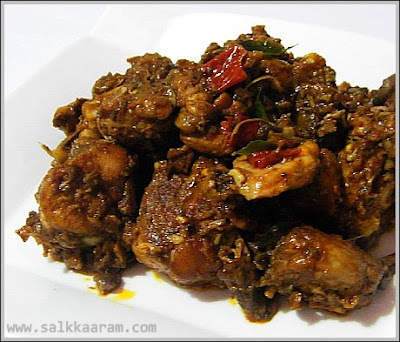 Great recipe Seena....Love the color...No wonder it was spicy, it has all the heat from peppers and chilly...Nice clicks too..
Hi Seena, hope you are fine. Reading so hotttt.. made me feel in mouth.but that looks quiet tempting dear.would love to try. going to try today for the dinner. this looks mouthwatering. kandittu kazhikaan thonnunnu. I do visit your blog quite often and have tried many of ur recipes,they are all simply awesome.They are truely "Simple and Delicious"!! :)The recipe never requires any extraordinary ingredient and yet the dish turns out super tasty.I tried out this recipe for dinner and it was fantastic.KUDOS to ur great work!! Dear Seena, I've been following your blog for quite sometime now. Its my favourite one. You really do post great mouth- watering recipes (pics are great too). Keep up the good work. Looking forward to many more palate-teasers. Gorgeous chicken dish it sounds so flavorful. This is a marvelous recipe. I think I bumped into this site almost one year before. I had tried this and it came out very well. We love to eat with boiled rice. Really a promising recipe for evry1 to try. Im here aftr almost 1 yr. The site seemed little rearranged..the older version was easier to follow. Thanks Neenu Praveen for the lovely comment!